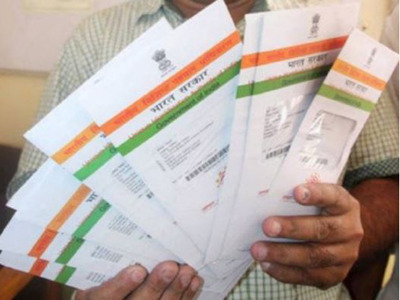 NEW DELHI: Mandatory Aadhaar disclosure during the All India Survey on Higher Education 2016-17 (AISHE) revealed that there are over 80,000 teachers who are faculty members of three or more higher education institutions in the country. This was disclosed by the Human Resource Development minister Prakash Javadekar, at the release of the final AISHE 2016-17 report on Friday. The HRD ministry has identified around 80,000 “ghost” teachers in various colleges and universities across the country after the introduction of Aadhaar. So far, 85% of the teachers have given their Aadhaar numbers, and the ministry believes that the number would increase when all the teachers comply. “There are certain ‘ghost’ teachers who use proxy methods and are apparently teaching at multiple places as full-time employees. After the introduction of Aadhaar, 80,000 such teachers have been identified and action will be taken against them,” Javadekar said. The minister, however, clarified that none of these teachers are from any central universities. “The ghost teachers have not been identified in any central universities but in some state varsities and private ones,” he said. The HRD ministry has asked all varsities to seek Aadhaar number from all employees and students to ensure that there is no duplication. “Sharing Aadhaar number is like sharing your mobile number or Email ID. Sharing your mobile number doesn’t mean the person you give it to can see your text messages. Aadhaar works the same way. It is protected,” Javadekar said. The report also highlighted the growth in the sector as the Gross Enrolment Ratio (GER) now stands at 25.5% as against 21.5%, five years ago. In last five years, the GER of the Muslims and other minority communities has been slow. From 4.15% GER of the Muslim youth (age group of 18-23 years) in 2012-13, it is just 4.90% in 2016-17. Similarly, the GER growth for other minority groups has been 0.33% in the same period. The survey also indicates that in last five years, the student population of higher education between the age of 18 and 23 has increased by 35 lakh. While there are just 9.3% colleges exclusively for girls, there are 15 women exclusive universities across 10 states. There has also been a significant increase in the number of universities and colleges in last five years, with the state private and public universities having the biggest share. Among the colleges too, majority of them are privately owned. Bengaluru has emerged as the major education hub with the biggest cluster of colleges (1025), followed by Jaipur and Hyderabad with 635 and 487 colleges respectively, the report stated. The survey covers almost all the higher education institutions across the country. Identified nodal officers from each institution are primarily responsible for collecting and uploading the data on AISHE portal in a secured environment. Javadekar also launched “Gurujan” – a portal for information on teachers.